I see a dark reddish amber colored rum in the bottle, turning to a lighter copper color in the tasting glass. A potent pot-distilled rum bouquet wafts out of the bottle like a heavy treacle fog of past Cuban free spirits. On the nose, even at nearly double the strength of most sipping rums, this Lost Spirits expression immediately evokes the soft nuances found in several of the finer aged rums from Cuba, Panama and the Dominican Republic. Such rums tend to be cleanly distilled, highly rectified spirits that rely heavily on the wood of the barrel to define them. 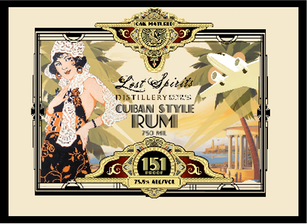 And Lost Spirits Cuban Inspired rum captures that paraffin, oak aged essence marvelously, with prescient vanillans, caramel, flour pastry, mild coconut, nutmeg, a fair amount of overripe tropical fruit and a hint of copper from the fermentation tank and still. Clearly, there’s a lot going on inside this rum, and the high 75.5% ABV help deliver the aromatic semi-volatile compounds more efficiently to your nose. In any case, the rum rewards prolonged careful sniffing. The initial taste delivers flavors so familiar to Lost Spirits other fine rums and whiskeys - their cultivated yeast ensures it so. Above that you taste a big woody overproof spiced jewel of a rum, with potent oaken vanilla, nutmeg and fruit showing a deft consistency during the segue from aromas to flavors. The medium-to-heavy weight body underscores the significance of what you taste, then the finish ends with more caramel, butterscotch and a lingering spiciness. You don’t often reach for an overproof rum when you want to sip something neat, and Lost Spirits Cuban Inspired rum is no exception, but dammit, it’s good enough to drink that way. Salud! RG: Lost Spirits produces rum in single batches from a small copper pot still. I expect the aromas and flavors to be big and powerful with every new batch, although they may vary with each iteration, as no additives adulterate the rum for consistency. Lost Spirits Cuban Inspired rum makes no age declaration, and for good reason. It’s not aged in the Millenium-old traditions. Rather, it is matured using patented methods that I am not at liberty to discuss. Trust me, they are natural and simply hurry Mother Nature along. The bottle does however claim no coloring nor flavoring additives, and adds a bit of transparency by revealing the source materials; “baking grade molasses, water and a yeast culture.” I can tell you that Davis uses a similar foundation yeast strain for all of his liquors, giving each Lost Spirits product their signature flavor. Bryan Davis is no stranger to making unique spirits, His Navy Style overproof rum has set the rum world all abuzz, and his heavily peated American whiskies, Leviathan and Ouroboros have twice the peat of most Scotch Whisky’s, and rival some old favorites among single malt aficionados. He sent the following notes to the Rum Gallery detailing his latest creation. Lost Spirits liquors are the definition of Hand Crafted. Davis built his own hand-hammered and silver soldered copper pot still and fermentation tank, cultivated his own strain of yeast, developed patented maturation techniques, bottles the liquors by hand, and even drew the label that evokes Maxfield Parrish's art. 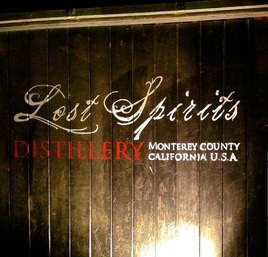 You can visit the Lost Spirits via Rum Gallery’s photo tour of the distillery - click here. Lost Spirits rums are as real as they get – I’ve watched all of them develop and prosper into exciting spirits over the past few years. Try some, you owe it to yourself to sample this potently flavorful American success story. Sure, patented maturing techniques and funky yeast strains on starvation diets are interesting. 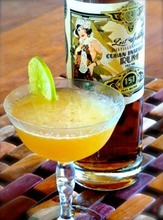 But the measure of a rum that purports to be Cuban Inspired simply must make a slayer of a classic daiquiri. So, does Lost Spirits’ latest overproof rum stand up to that challenge? Seguro que si! (Hell yes!) Lime juice and sugarcane syrup simply add more fuel to this house afire. Reviewed: August 2014 at The Rum Gallery, USA.